WHEN IT COMES TO STAKING TOMATOES, I rely on the wisdom of the late, great Joan Crawford, who famously shrieked “No wire cages — EVER!” Okay, she was talking about wire hangers. Still, I loathe tomato cages. Most are poorly soldered — my partner nearly poked an eye out on a loose wire while bending to pick a tomato. Furthermore, all but the really expensive “Texas” -type cages are too short for indeterminate varieties. I like a tomato support that permits air and sunlight to reach the plants. And that’s why I built — with no carpentry skills whatsoever — the tee-pee trellis pictured above. This structure is similar to the one I built last year from sumac saplings. But the new model is sturdier, I think. It’s taller, too, standing seven feet above the soil level. True, vines must be tied to such a support. But that’s a fun job. 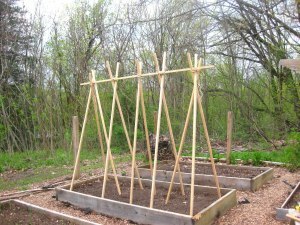 If you wish to build a tee-pee trellis, arrange 3 poles in a V-shape at each end of a bed, and pound them one foot deep into the ground. Arrange another pole as a cross beam on top. Then place pairs of poles along the cross beam. Tie the poles in place with heavy twine. If you can’t tie a knot, just tie a lot. 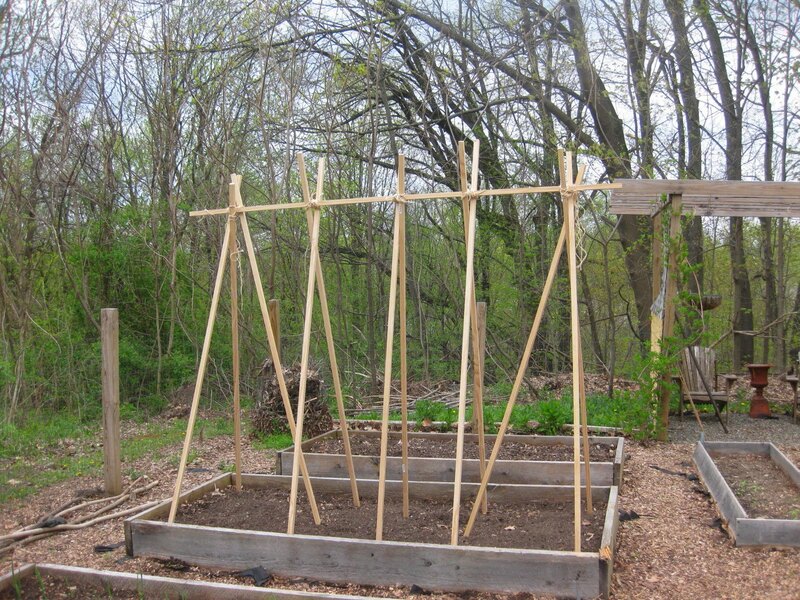 My trellis was built from sturdy, 1″x1″x8′ poles, obtained from a local lumber yard. Tall bamboo would be as good, if you have access to it. My poles are made of pine. These were easy enough to install, and they will be easy to disassemble and store for winter. I suspect they will last for many years. Of course any tall trellis is bound to add romance to a kitchen garden, for it provides a pleasing vertical element. Birds are enchanted by tee-pees — more than once I’ve caught them perching on the poles, surveying the landscape below. 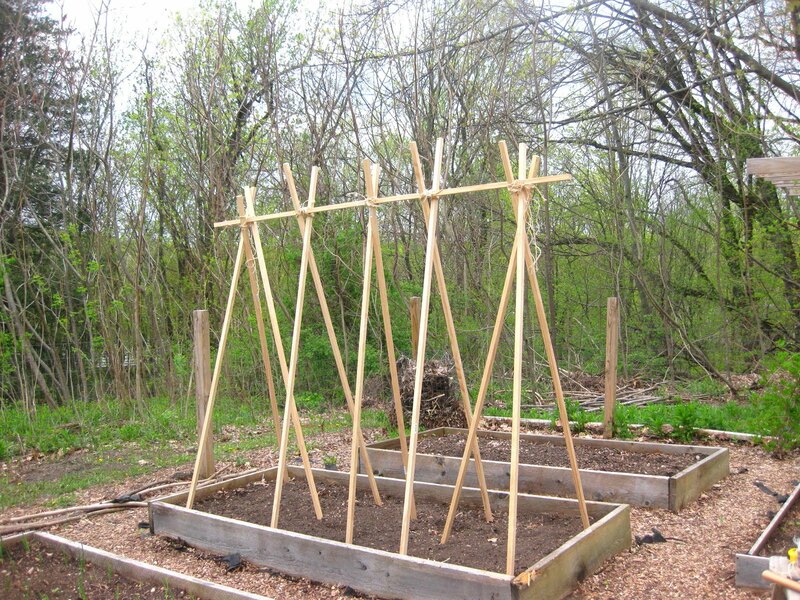 Is a tee-pee trellis for you? Or do you prefer some other tomato-support system? Speak your mind in the comments field below. Kevin, I hate tomato cages too. The ones I bought at Home Depot fell apart after one season. 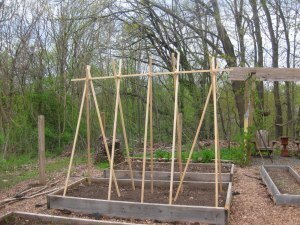 If I can't build a tee pee trellis, I'll just grow them along the fence and hope for the best. Mommie Dearest was a hoot! 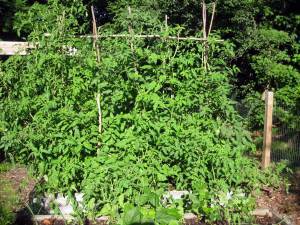 Sheila – fences can be terrific for tomatoes. I intend to grow my paste-varieties along the fence in my Herb Garden. Yes, Mommie Dearest was terrific! I read the book as a teenager, and later saw the movie version. Faye Dunaway WAS Joan Crawford! I like your tee-pee trellis! I know what you mean about the cages being too short. The vines grow and then fall over the sides. I really need something tall for trellising mine, and will the pine pole teepee option. This looks good!!! I think the key is getting them way way down in the ground:) My homemade trellis fell over last year also when they were heavy with tomatoes and a big wind storm came. Terry – My old trellis came down during a windstorm too last fall, fortunately after most of the tomatoes had been harvested. I think this one will hold. As you said, it's crucial to pound the poles deeply into the ground. BBI – Thanks for the submission. I'll admit I'm really proud of this trellis. It has already endured a number of ferocious, hurricane-type storms here. It hasn't budged a bit. Rebar is forever. You know the kind of steel bar that is used in concrete to stabilize it. I went to Barker Steel in MA that cut about (60) 3/4″ 8 ft poles for me. Cut up strips of old fabric to tie tomato plants to the rebar pole as they grow. Plus a string, pole to pole to tie the beans to. They will last forever and you will be able to pass them down to your grandchildren. The total cost was not too bad either. Wendy Skillman – nice to meet you. I agree with you on rebar, and will probably switch to it when, finally, my wooden poles bite the dust. I was just looking at some garden sites and came acrossed yours. Just thought I would share a tomato steaking trick that I tried and it really worked. i put metal steaks about 12 foot apart and then stung wire between them as the plant grows you put the plant on either side as it grows and I used shower curtain holders to keep the plant from falling over and hooked it to each wire as it grew. I weaved the plant between the wires. I had great luck with it last year. My tomato plants were about 7 foot tall and I had an abundance of tomatoes on them, about 11/2 bushel a week, and they never hit the ground. another way I water my tomato plants and cucumbers is to use those old pots that you get from the garden store, the gallon ones that are plastic. I dig a whole by my plant deepenough to put one in upside down, then put one in right side up and fill in with dirt. I put one for every two plants, and fill them with water every other day. I had more tomatoes and cucmbers this year then I have ever had before. But the PVC pipe thing sounds interesting too. Kim – I did something something similar one year, by inserting metal steaks at each corner of one of my raised beds. Then, like you, I strung several levels of wire between the two. I used twist-ties to train the vines, but your shower-curtain holders sound ideal. Now, I’m curious about the gallon-size plant containers. Did you pour the water into the container which you had filled with dirt, in order that the water would trickle down slowly? Would love for you to explain this more. Sounds intriguing. I didn’t stake my paste tomato at all last year. I just let if vine around on the ground… we harvested over ten pounds of tomatoes from it and it never noticed it wasn’t stake. Fourty years ago the Japanese farmer that lived high on a bench above our town grew tomatoes for commercial (farmgate) sales. He didn’t stake one of them. They grew like pumpkins and squash. You picked them the same way. No trellis needed. Has anyone heard of the spiral tomato sticks? I used to use rebar tepees, and had to tie each plant on several times during the growing season – took a lot of time with 50+ tomatoes. A few years ago the spirals were on special offer, and they are wonderful. you just feed the plant into it as it grows and it supports itself. if you see them try them you’ll probably not want to go back to regular stakes. I love this idea! I also want to try the bottle-watering thing. However, since my tomatoes are in square pots, one plant per pot, I’ll probably use 4 of the smaller water bottles, and bury them at the corners of each pot, and just fill each little bottle every other day or so. I have a 24-pack of bottled water that I just do NOT like the taste of, so I’ll drill some holes and bury those suckers in my tomato pots. I have to try the trellis, too. We got this folding wooden thing, that looks like a sandwich board sign, and it keeps falling over, with the smallest breeze. Fortunately, the plants aren’t tall enough to need any support, yet. Give it a week or two, right? I assume you use the poles to tie the tomato vines to? How many plants would the above-pictured trellis support? I’m tempted to try it. No more wire hangers—EVARRR!!!! Oh my gosh I love it! I read that book and saw the movie too. Hysterical, but true. I HATE tomato cages too! Luckily I have wised up and started using some of the excessive bamboo in my Mother in Law’s back yard. I have done individual tepees in the past, but I really like this trellis idea. Gonna give it a try myself this year and will let you know how it goes! Happy gardening! We grow in raised beds 4’X 8′. I placed 2 together (for 16′) put a steel fence post in each end and 1 in the middle of the 2 boxes centerd in the boxes and used cattle fence wired to the fence posts for tomatoe trellis, squash, gourds, melons and cucumbers.I lay tomatoes down in the box (for added roots) and then tie them as they reach the trellis..Stronger stems;prune the suckers that don’t have flowers and lots of tomatoes.. I constructed your Joan Crawford Tomato Trellis last summer at my 8 x 4 raised bed at the community garden in my neighborhood. I planted 10 heirloom plants, five on each side. Around the perimeter of the bed I planted carrots as a companion planting. I also took you advice, and weekly removed all suckers from these plants. This tomato cathedral was the talk of the neighborhood. I would be in the garden and people would come in from the street to look at the tomaotes. Never have I had such success with tomatoes. They were picture perfect. My two favorites, Caspian Pink and Marianna’s Peace were the largest and most trouble free I have ever grown. This year I am going to build another tomato cathedral in one of my raised beds at home so I can double production. This year I will be sure to take pictures and send to you. Thanks for the great growing tips. Love the ideas here. Thanks for sharing everyone! The holey water bottle work great. I also like using two clay pots placed with wide edges meeting at the middle. Bury like the plastic pot idea and fill it with water as needed. The clay allows the moisture to be released into the soil as needed by the plants. Put a pretty stone or decorative item over the hole to keep water from evaporating and it looks nice. Jimmer – Would absolutely LOVE to see photos of your trellis. So glad it worked out for you, and that it attracted attention. Joan Crawford would be very proud. Love the trellis! I’m planning to build one. Now, where will you plant the tomatoes, between the poles? Sorry, but I made wire cages from WWM 6×6 10/10 concrete slab woven wire mesh. Using a 5′ length I made a circle that is 5′ tall. The holes are large enough to reach inside to pick fruit or raise a limb up to the next level as they grow. I have mine in pots right next to the fence this year. I think the fence will be great support. It is hard to find sunny places in my yard, because of the wonderful big oak trees, so this might just be perfect. Wish me luck. Tried starting my tomatoes indoors in Topsy-turvy planters this year to hang from my porch. Sounded like a good idea, and a friend who gardens very successfully swears by it. Never again! The poor plants that started out so well are losing leaves and struggling from being wetted every day and nothing seems to help them recover. We may have to cut them out of there and repot them and are definitely going to start some new ones in pots. I’ll go back to and stick with staking them! Ginger – Good news for you in this post: How I Ripen Tomatoes Indoors. Morgan – Nice to hear about your experience with the “topsy-turvy” tomato pots. Consumer Reports tested the bags, and found them tricky to use. and can you suggest how to make cucumbers climb instead of letting grow out of my box garden? Heidi – When I grow tomatoes up a trellis, I always use string, stretchy tape or Velcro tape to secure the vines to the poles. I hate the tomato cages. To short and it hard to get the tomato plant to grow on them. I’ve had the plants pull them out of the ground before. Tried making ones that cross each other, tried leaving them to their own growing design, still nothing has worked. 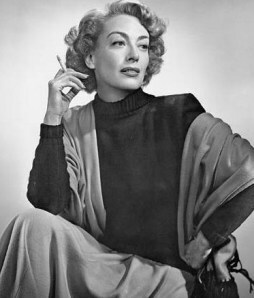 So I’m going to try the Joan Crawford next year. The tee- pee style is how we always did our green beans… Thanks Kevin.. I have always been fascinated by the trellis. In the past, we would travel to Italy and would notice that 99% of the gardens utilized the trellis system. For some odd reason, I always felt a little intimidated by such system and would continue using individual stakes per plant. My question is do the plants grow on the inside of the trellis or on the outside? If anyone could explain the basics of planting I would be very grateful. Thanks! Hi Sal – You can plant inside or outside the trellis. The vines will naturally grow towards the sun. Thx, Kevin. I’m assuming that I build my trellis after the plants are ready to be staked. Sorry for the stupid question…. I bought my Texas Tomato Cages more than a decade ago and they’re all going strong, great product. And with that long a life, they’re not so expensive. But I’ve found increasingly that I use them at half-height for peppers and eggplant, half or full for dahlias. I get easier control and better health for tomatoes using concrete reinforcing grid mounted between cedar posts. You just weave the vines in and out, no tying. Easy to spot and remove suckers, and excellent air circulation. They’re permanent, and I alternate the tomatoes with climbing peas and beans, or cucumbers & melons, in a three-year cycle. I use the weave too but mine collapses under the tomatoes weight. But please enter me for the weed knife giveaway cause I really could use that tool. Or if I’m not a winner please list sources where it’s available. 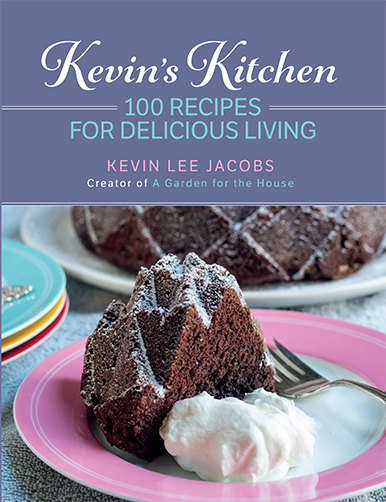 Thanks, love your posts and recipe – eagerly awaiting the next volume! Starting ours today. Can’t wait for Joan to grace the garden. Are yours up yet for this season? Kevin: Wondering what is best to use to support scarlet runner beans. I use netting between two posts but not an ideal way. Ideas welcome. Have very limited space. AH-HA! Now THIS is a trellis. I made the mistake of purchasing those NASTY wire hanger baskets… although I sprung for the large ones… they are still USELESS when it comes to tomatoes! I’ll be making your tomato pie for dinner this day. Thanks for a great experience Kevin. Kevin, I love what you do and your approach to life. I wish you were my neighbor! So, we’ve given up on the eternally frustrating tomato cages this year in favor if the trellises you describe. Now that we have then built, I’m wondering how you fasten your tomato plants to them. I couldn’t tell from your picture. Thanks. 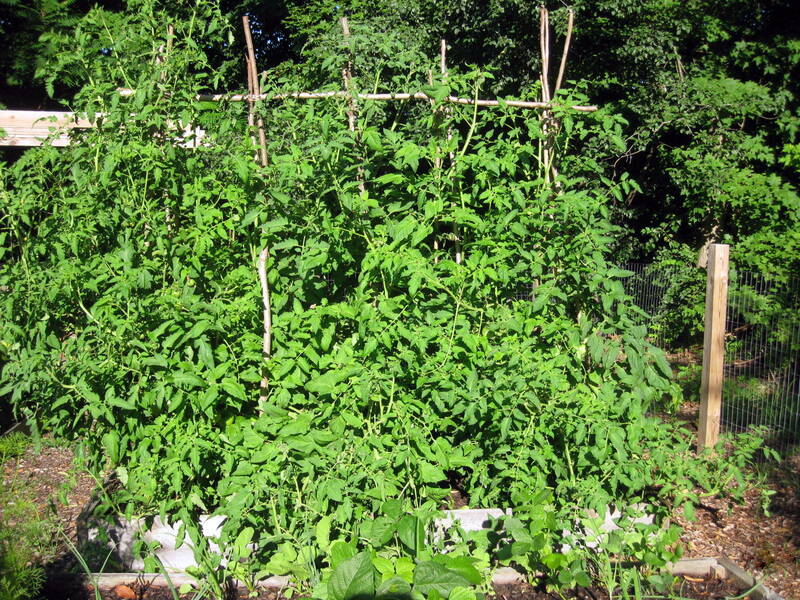 Hi Margaret – When I can find it, I use green Velcro “garden-tape” to loosely tie the tomato vines to the trellis. Otherwise, I tie the vines with common string, twine, jute-twine, or even strips cut from plastic bags. Just remember not to tie too tightly, or you might choke the vines as they grow! Your tomato trellis sent me back YEARS ago when I would play in the tee-pees my parents made to grow those delicious green beans my siblings and I grew up on. The garden was always an adventure with rows of corn to walk through and bean poles to play hide and seek in. I now get to work my deceased parents’ garden spot. I just may set up some tee-pees in their honor. I used to make tomato tee pees out of fallen tree limbs. I left them up after the harvest since I could easily make new ones the next year. They made a nice focal point in the yard when all else was bare ! I am now an apartment dweller so no longer make tree limb tee pees . But I have a different kind indoors for my little granddaughter ! The only reason I wouldn’t use wood is the risk of early or late blight. Unless you use new wood every year, the pathogens will be introduced to your next plants tied to it. I have folding cages that can stack. I like that I can wash them with a little bleach, rinse well, and reuse them. Thanks, Kevin. I’m going to try this and I’m forwarding it on to my daughter, also. Love your blog! Kevin – I can’t seem to get your link to “desuckering tomatoes” to work. Can you check on that and maybe repost it? I just found out that I should have been doing it but I don’t really know how! 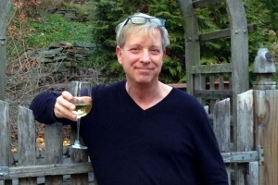 Thanks for a GREAT blog – I thoroughly enjoy all of your posts and have enjoyed many of your delicious recipes too. Hi K Brown – De-Suckering Tomatoes link is fixed now. Thanks for the alert! Dare I say this? I previously used steel farm fence posts and they worked great. Several years ago I spotted these v-shaped steel supports in Gardeners Su_____…. They are absolutely perfect. Each fall I pull them up, hose them off and stack them into each other vertically, stand them on the floor in a corner of my shelves, bungee tie them upright and don’t deal with them until next June – they are great. Mine are at least 10 years old and never expect to need to replace them. No assembly each season and they do the job perfectly. I really do recommend them to any serious tomato gardener. My apologies Kevin but they are too good to keep secret. I may try this for squash this year. Seems sturdy enough. Kevin: I’m going to give this tee-pee trellis a try. I never know what to do with my tomatoes. The best I’ve found was to plant them on the inside of the fence I have around my veggie garden (much needed to keep the deer out) but then I have to stake the insides to keep them from falling. It’s a mess. I’ll let you know. About how many tomato plants do you get in a raised bed with trellis? Thanks for so much help. Oh, I’m going to try the leek suggestion. Mine are never bottom heavy enough. I use PVC pipe cut to about 18″ to pound into the ground and then put my 3 legged wooden ladders I use for cucumbers and beans in the pipe to secure. That way the wood is not in the ground and will last longer. Would work for trellis posts or lattices too. The width of pipe depends on the size of post you have. Instead of twine to tie up plants I latch onto any old pantyhose or knee highs (remember those?) I can find. They are great after cut into strips. Also, those net shower scrubbies are good. Once they start falling apart just undo them and you have many yards of netting. Just be sure to wash it well before using.